You don’t need me to tell you how great Super Mario Bros. is, you can read that here. Nor do you probably need me to tell you that a game both that well-made and that important to the gaming landscape at the time is going to demand a sequel. I mean, think about it, give Nintendo another couple years to sand down the rough corners with the original and put a couple more years of technology and programming know-how behind Mario and we’re absolutely guaranteed to get a game that blows our collective minds, right? Well, why are we here bumping gums, let’s get into it, Super Mario Bros. 2 for NES, released by our Nintendo overlords in 1988! Hey…wait a minute…what, uh, what’s this? This…this isn’t a Mario game…I mean, yeah, that’s Mario, but where are the Fire Flowers? Where are the Piranha Plants? Where are the Goombas? WHERE ARE THE GOOMBAS? Well, I imagine most of you reading this are enough of gaming nerds to know this story, but if not, lemme explain. Y’see, in 1987, a true sequel to Super Mario Bros. was released for Famicom over in Japan. For whatever reason, most likely the increased difficulty level, that version never made it across the Pacific until the superb Super Nintendo compilation Super Mario All-Stars, where it was packaged as “The Lost Levels”. Meanwhile, Nintendo still wanted to cash in on the popularity of Super Mario Bros. on this side of the ocean, so they took a completely unrelated game called Doki Doki Panic and re-did it with Mario characters, creating the Super Mario Bros. 2 that we know today. So, in other words, characters like Birdo and Pokey made it into Mario canon basically by accident. Now, just because this isn’t a traditional Mario game, does that make it a bad game? Not hardly. What we have here is still quite good, but it does take some adjusting to. 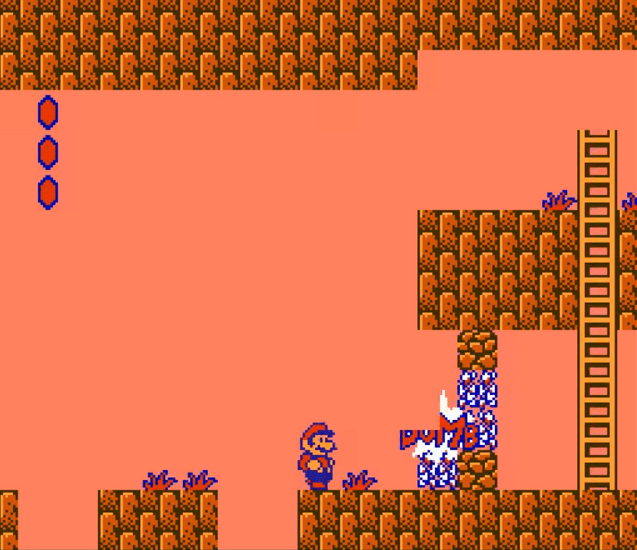 For one, your traditional attacks of hopping on the heads of enemies and mowing them down with fireballs are nowhere to be found, instead, most of your offense will consist of picking up objects like giant vegetables, mushroom blocks, and other enemies and hucking them at baddies, and you can even spawn a life-refilling heart if you conk out a chain reaction of opponents. The invincibility stars that allowed you to berzerker your way through levels in the first game are still present, and serve the exact same purpose, but it doesn’t quite feel the same as it did before, I think partially because it’s just less rewarding to blitz through a Shy Guy than it is a Hammer Brother. You’ll happen upon magic potions that morph into a door when you toss them, and going through that door takes you to a sub-space where the veggies are replaced by coins you can use in a post-stage slot machine for extra lives, and you can pick up mushrooms that allow you to take another hit before losing a life. You’ll frequently have to unlock doors by pilfering giant keys and lugging them to the doors, all the while being chased by this really creepy mask that divebombs you like a hungry vulture attacking a scampering rabbit. 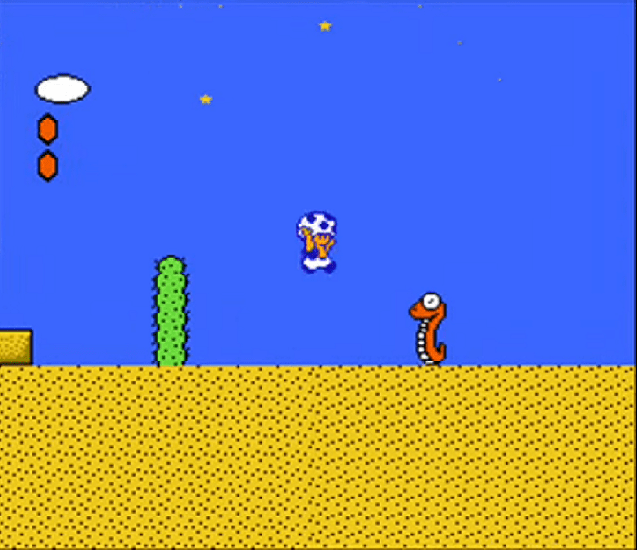 Toad confronts a sneaky snake. However, perhaps the most intriguing new development in the gameplay here is the inclusion of a character select system. Unlike the original Super Mario Bros., or, in fact, many of the later Mario titles, you’re not limited to playing as Mario himself. Here, you can select from a cast of four: Mario, who has average, well-rounded abilities, Luigi, who has freakish jumping ability but picks things out of the ground very slowly, Toad, who has weak hops but digs like a prairie dog, and Princess Toadstool, who has the ability to float for a limited time when she jumps. It’s a very nice addition, as each of the characters provides a different challenge, and have their own occasions when they’re the best for the job; if you’re in the desert and you’re going to be digging through deep piles of sand, Toad’s your guy, and if you’re going to be facing a lot of gaping chasms and tricky jumps, Luigi or Toadstool should be your go-tos. Oddly enough, despite these core characters making the cut for the sequel, one staple of the Mario franchise is conspicuously absent from the proceedings, and that is Bowser himself, as the Koopa King is replaced for this adventure by Wart, who instead of a giant evil turtle, is a giant evil frog that steals people’s dreams instead of kidnapping the princess. 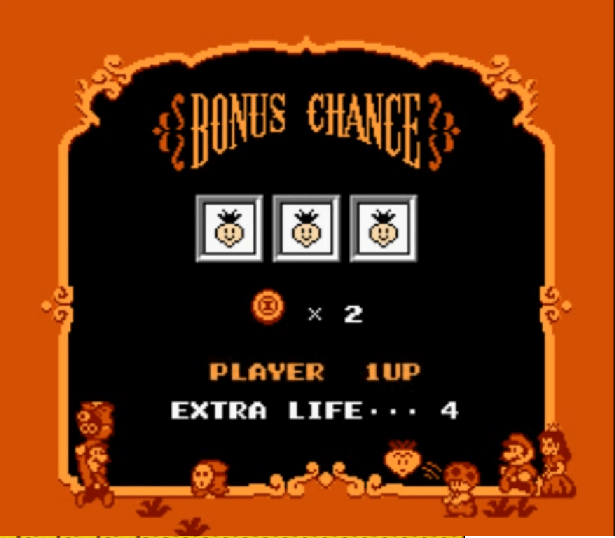 SMB2 also differs from its predecessor by feeling slightly less linear. Instead of just a straight dash to the right side of the screen with enemies and obstacles, this game has areas where you will travel one direction at one point and back the other way later on. 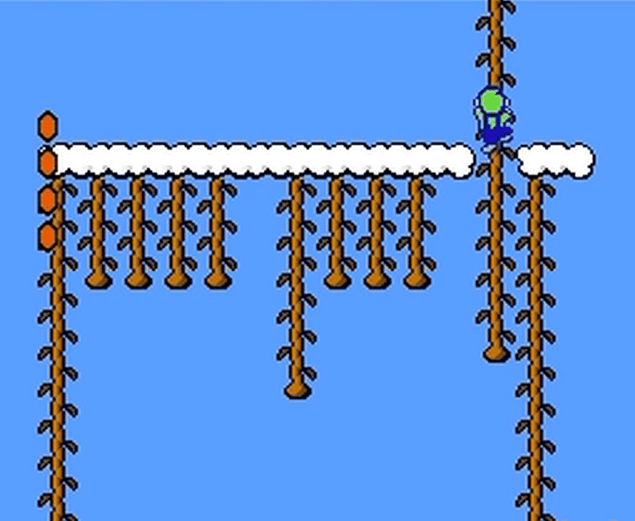 There’s a lot more of a vertical inclination here; there are spots where you’ll be climbing chains and vines to reach the tops of areas, or, as I mentioned above, digging through sand dunes and then having to race back up them after collecting a key. You’ll also be hopping onto magic carpets and on the backs of flying enemies to get across wide gaps, and going from one locale to another in a very, VERY sketchy rocketship. 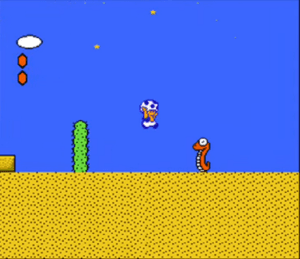 At times, you’ll even be able to take different paths by doing things like blowing holes in walls with bombs that you pull out of the ground, and if you’re diligent, you’ll find places that allow you to warp from one level to another one entirely, but unlike the Warp Zones from the original, these might take a little more thought to locate than simply getting atop the level’s architecture and going over an exit. Plenty of vines to scamper up! Another fear I can assuage is with the play control. A Mario game is nothing without tight controls, and the handling here is quite smooth. Some aspects of it might take some getting used to, like Luigi’s floatiness when he jumps, or remembering exactly how long you have with Toadstool’s levitation, but you’ll sort those out fairly quickly. One new addition is the ability to super jump by squatting down and holding B until your character begins flashing, which is helpful if you want to make a big leap but didn’t pick a character with much hangtime. 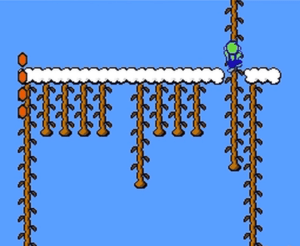 Even in places like the mandatory ice level, where you slip and slide around with extra momentum, or the stages where you’re going up are handled pretty well, jumping from vine to vine or chain to chain feels natural, and is very forgiving, so you never have to worry about being spot-on every time or slipping off to your death. 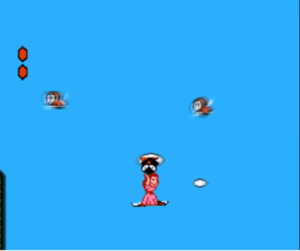 You’ll even have an easy time jumping onto moving objects, like Birdo’s eggs that you need to throw in her face to defeat her. As you would expect from a first-party Nintendo title, the whole package looks and sounds wonderful. Characters and their sprites look a bit less pixel-y than the original, which is to be expected given a couple more years forward, and everything’s just the right size to be injected with personality; Snifits hop around and spit shiny black projectiles at you, bombs explode with a flash and an Adam West Batman-esque “BOMB” effect, and Luigi’s little leg kicks when he’s getting maximum air are a delight. There aren’t a ton of background themes here, but the ones you’ll hear are still quite excellent; as soon as I popped in the game and got to the first stage, I immediately recognized the level theme just the same as if I’d played this every day and not several years ago. The sound effects are a treat, as well, from the low-pitch BOWWW of Birdo launching an egg at you to the always-enjoyable thwack of one enemy getting slammed into another and the crunchy thud of a POW Block being dropped. While SMB2 might not get the same laurels for its images and sounds as its older brother, there’s still nothing to sneeze at here. Sorry, bro, the Princess needs your carpet. Super Mario Bros. 2 is very much the forgotten member of the original SMB trilogy. It’s not the same groundbreaking sea change in the gaming industry that Super Mario Bros. represented, nor is it the refinement of the Mario formula into concentrated excellence the way Super Mario Bros. 3 was, but it’s still a quality game that’s fun to play through and captures the spirit of the games very well, which is amazing considering that this was a different game altogether with a Mario-themed coat of paint. While it’s very unlikely you haven’t played this game in some capacity, whether it be the original NES version, the remastered Super Mario All-Stars edition, or an iteration on Nintendo’s more recent consoles, if you’re one of those who hasn’t given this one a go, I would advise you to do so, and if you have played this one before, but like me, haven’t touched it in several years for one reason or another, I’d also say to fire it up again. I definitely recommend it, and in a way, you can describe it the same way American icon Bob Ross would: as a happy accident. A fun platformer that provides a very different kind of Mario challenge, smooth controls, quality sound and graphics, and the character selection features adds a new layer to the gameplay. If you were expecting a true sequel to Super Mario Bros., you had to either score yourself a Famicom or wait a few years.